The Optimization page under the Project tab allows you to control how HOMER finds the optimal system. The Optimization page is divided into two parts. On the left are the Optimization Settings, where you can apply rules to exclude some kinds of systems from the optimization. 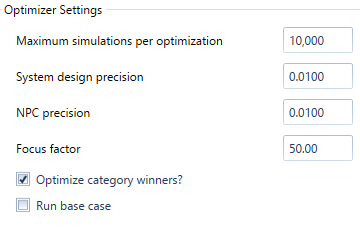 On the right are Optimizer Settings that control certain aspects of the numerical optimization. 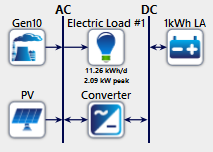 HOMER uses the simulation time step to simulate the operation of each system configuration. 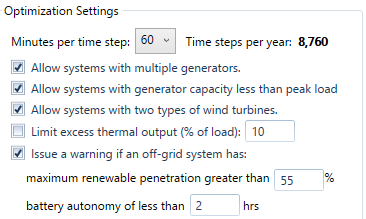 You can set this value by selecting one of the values between one hour and one minute from the "Minutes per time step:" drop-down menu. 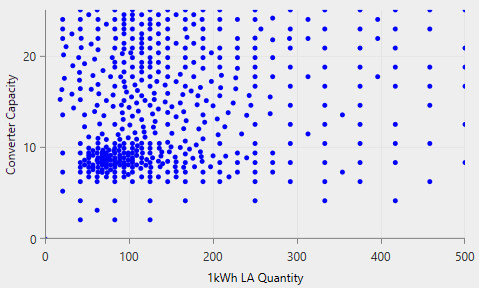 The simulation time step does not have to match the time step of any time series load or resource data you may have imported. See the simulation time step section of the help for details. The other options in this section allow you to exclude systems that meet certain criteria, or flag certain systems with a warning. You can opt to use the HOMER Optimizer for the Converter, Storage, PV, and Wind Turbine Components. 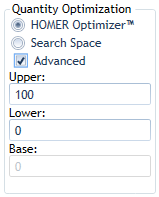 Click the HOMER Optimizer radio button to enable the Optimizer in the Optimization table. 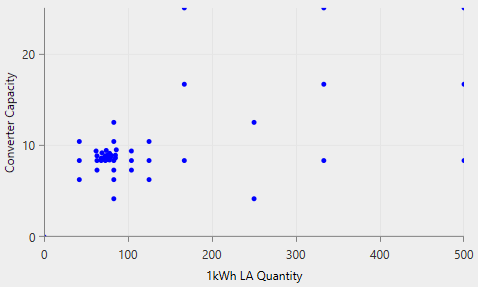 Check the Advanced button to change the Upper and Lower values.